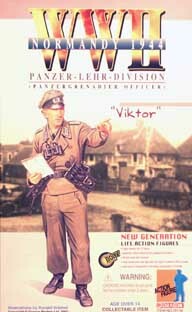 This is Viktor, a Panzergrenadier officer in the Panzer Lehr Division. 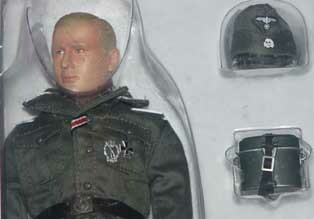 He comes with a Luger, an MP40, helmet and visor cap, pluse more. It has been decomissioned by Dragon and is hard to find. 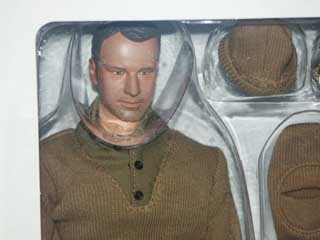 The figure is 1/6th scale and stands approximately 12 inches high. Figure is new and in the box. 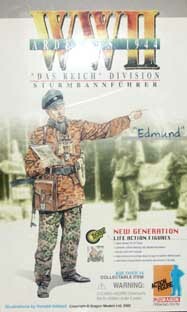 This is Edmund, a Sturmbannfuhrer in the SS-Das Reich Division. He is has a camouflage smock to go over his tunic. The tunic sports the ribbon for the Iron Cross 2nd class as well as an Iron Cross 1st class. 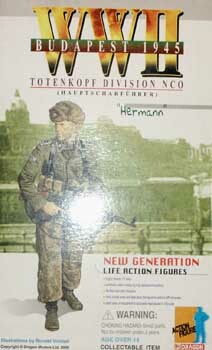 There is also a cuff title for Das Reich Division. Edmund has an officers visor cap, and an MP44 as his weapon. 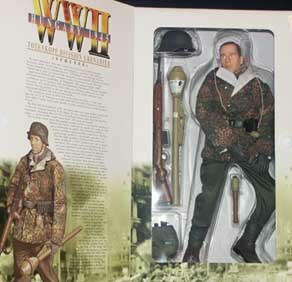 The figure is 1/6th scale and stands approximately 12 inches high. Figure is new and in the box. These figures are extremely detailed. They would complement a display as well as being a collectible in their own realm. This is Siegfried a fallschirmjager in FJR3 during the campaign in Crete in 1941. 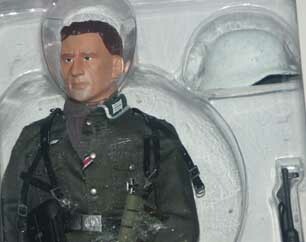 This figure is 1/6 th scale and stands approximately 12 inches tall. 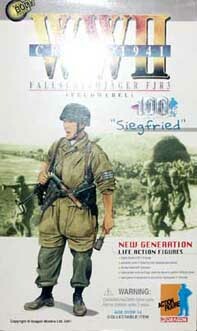 Siegfried was the 100th action figure made in the WWII series. 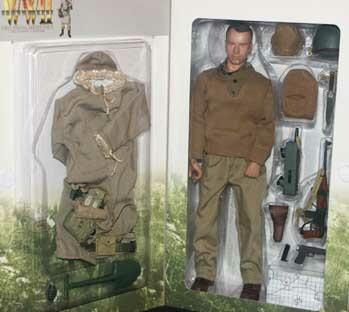 This action figure is very detailed and comes new in the box. 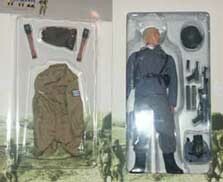 Various pieces of clothing, weapons, and equipment are included. This one has been decomissioned by Dragon and is hard to find. This is Nick Corrigan. He is a platoon leader in the U. S. first special service force in Italy during 1943. 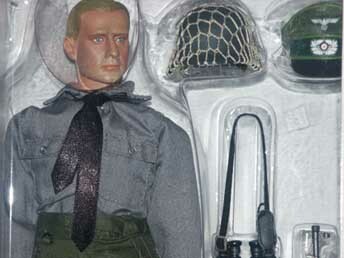 He comes with a walkie talkie, Colt .45 cal. pistol, an M-1 carbine, grenade, shovel and other items. 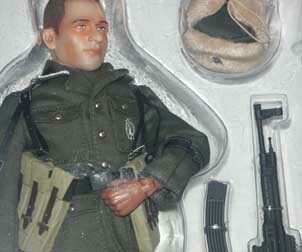 The figure is 1/6th scale and stands approximately 12 inches high. 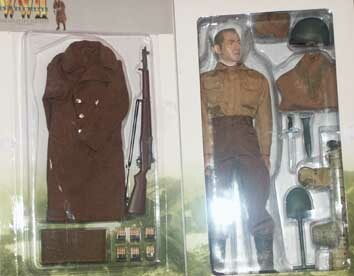 Figure is new and in the box. These figures are extremely detailed. They would complement a display as well as being a collectible in their own realm. This is Gunther. He is a schutze in a Gebirgsjager or mountain unit. These soldiers were trained extremely well on how to survive, move, and fight in this type of terrain. 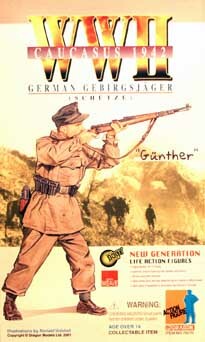 Gunther comes equipped with a Mauser, ice axe, and more. 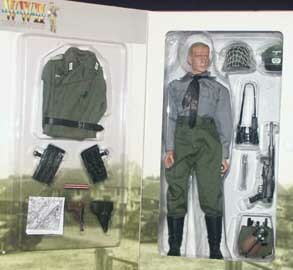 The figure is 1/6th scale and stands approximately 12 inches high. Figure is new and in the box. These figures are extremely detailed. They would complement a display as well as being a collectible in their own realm. 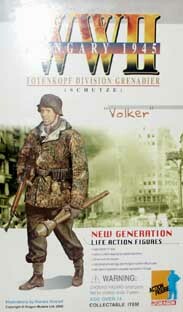 Volker is a schutze in the SS-Totenkopf Division. He is dressed in a camouflage reversible winter coat and issue gloves. 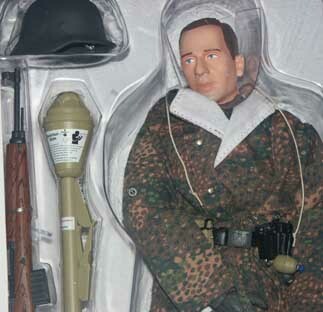 He is equipped with late war weapons, a semi-auto G43 rifle, grenades, and a Panzerfaust. This figure has been decomissioned by Dragon and is a hard one to find. 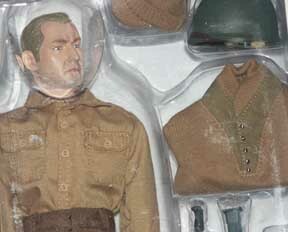 The figure is 1/6th scale and stands approximately 12 inches high. Figure is new and in the box. These figures are extremely detailed. They would complement a display as well as being a collectible in their own realm. 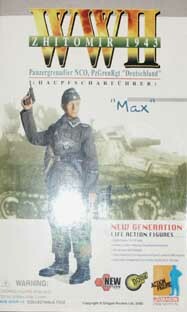 This is Max, a Haupfscharfuhrer with the SS-Deutschland Panzergrenadier regement. His uniform comes complete with an overseas cap with SS eagle and deaths head, Deutschland cuff title, SS belt buckle, a ribbon for the Iron Cross 2nd class in his button hole, an Iron Cross 1st class, and an infantry assault badge. 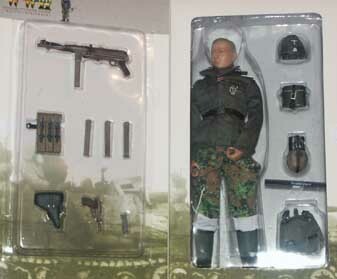 He has an MP40 and pistol as weapons. These are hard to find. 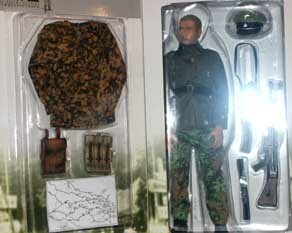 The figure is 1/6th scale and stands approximately 12 inches high. Figure is new and in the box. These figures are extremely detailed. They would complement a display as well as being a collectible in their own realm. 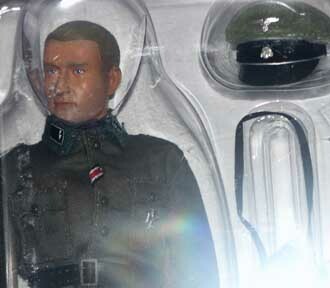 This is Hermann, a Hauptscharfuhrer in the SS-Totenkopf Division. 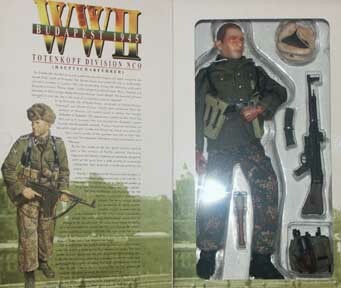 He comes complete with the SS-Totenkopf cuff title, an infantry assault badge, the SS belt buckle, Eastern Front style fur cap, a STG44 rifle, and more. 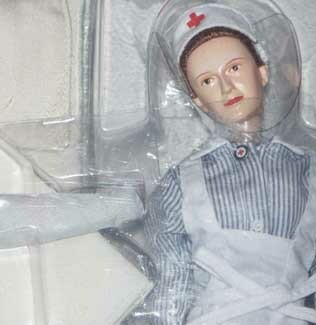 This is also a hard figure to find. 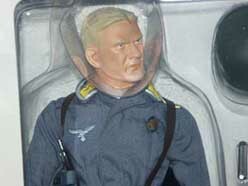 The figure is 1/6th scale and stands approximately 12 inches high. Figure is new and in the box. These figures are extremely detailed. They would complement a display as well as being a collectible in their own realm. 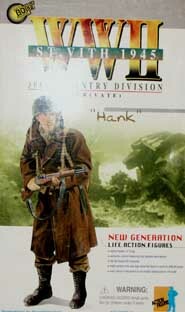 This is Hank, a Private with the U.S. 30th Infantry Division. Hank is ready for the cold weather and come equipped with an overcoat, sweater, scarf, and jeep cap. 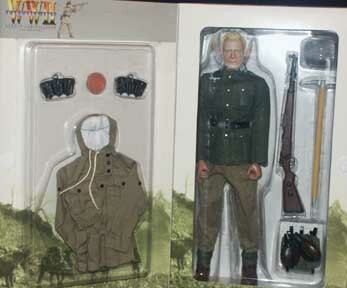 He is armed with an M1 Garand rifle with ammo and a bayonet. This is a good look at the U.S. serviceman during the last winter of WWII. The figure is 1/6th scale and stands approximately 12 inches high. Figure is new and in the box. These figures are extremely detailed. They would complement a display as well as being a collectible in their own realm. 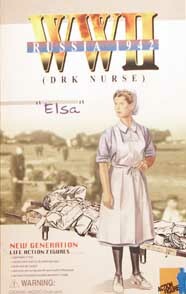 Elsa is a nurse with the German Red Cross. 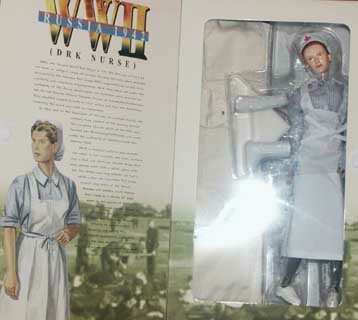 She comes complete with a blue and white pinstripe uniform covered by a white apron, stockings, a nurses hat, and a Red Cross pin. With this figure, you get a stretcher, a sling and a few casts. This figure has been decomissioned and is getting harder to find. The figure is 1/6th scale and stands approximately 12 inches high. Figure is new and in the box. These figures are extremely detailed. They would complement a display as well as being a collectible in their own realm. 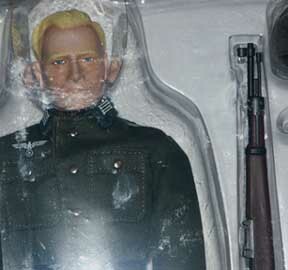 Hans is a Feldwebel in the Heer. He boasts an Iron Cross 2nd class ribbon in his tunic button hole as well as an Iron Cross 1st class. He is equipped for the colder Russian weather with his overcoat and scarf. 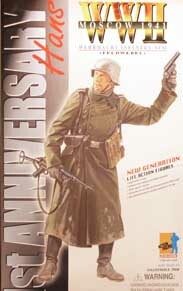 Hans is armed with an MP40, pistol, bayonet, and flare pistol. This was Dragons first anniversary figure. They expanded upon their first figure Hans from operation Barbarossa and now he is at the threshold of Moscow. This figure has been decomissioned by Dragon and are becoming scarce. The figure is 1/6th scale and stands approximately 12 inches high. Figure is new and in the box. These figures are extremely detailed. They would complement a display as well as being a collectible in their own realm.